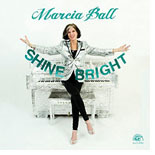 Shine Bright (Alligator Records) is by my count the 14th album released by the venerable Marcia Ball, and I can unequivocally say that this fantastic entertainer has never recorded anything that's less than excellent. She remains one of the most consistently outstanding performers in the blues world today. She puts everything she's got into every single song --- really, into every single note --- and her latest disc on Alligator is no exception. Ms. Ball is backed here by a rotating group of musicians depending on the recording location (Dockside Studio in Maurice, Louisiana and two different locations in Austin, Texas) as well as the needs of each of the dozen songs. Produced by Steve Berlin, Shine Bright is a delightful mix of Ball originals and well-chosen covers. Ms. Ball immediately shows off her extraordinary New Orleans-style piano skills on the title cut, an uplifting number on which she mentions both musicians (Little Richard, Irma Thomas, etc.) and non-musicians (Jackie Robinson, Ann Richards) who all shined bright in their influential lifetimes. Shelley King and Carolyn Wonderland contribute very fine backing vocals here, as they do on many of the album's cuts. The Ernie K-Doe 1962 Minit classic, "I Got To Find Somebody," is next, with the recurring line " ... find someone who will treat me right, so I can stay home at night ..."
It wouldn't be a Marcia Ball album without a song talking about driving around in some kind of classic car, and here she talks about a grandma's car on the mid-tempo shuffle "They Don't Make 'Em Like That." What makes every Ball album great is how she diversifies into so many different styles of music, with "Life Of The Party" having a calypso sound. Producer Berlin leads the horn section with great accompaniment on this one. The Ray Charles original "What Would I Do Without You" is an inspirational love story prefaced by a gospel piano introduction and a wall of soulful horns. Marcia's voice really makes this one feel oh so right. "When The Mardi Gras Is Over," with its traditional New Orleans second line beat, was written by backing singer and Austin regular Shelley King. What a party song --- Professor Longhair would be rockin' and rollin' with this one if he was still alive! Ms. Ball continues to prove that the blues doesn't always have to be sad music, as we hear on the mid-tempo shuffle "Once In A Lifetime Thing." A real true love is a once in a lifetime thing, so the listener is encouraged to hold onto that love. Great backing vocals here. The mid-tempo "Pots And Pans" talks about the folks taking the party to the street, featuring some mighty fine piano playing by Ms. Ball and B-3 from Red Young. The latter really shines on the slow blues "World Full Of Love," a beautiful number with minimal instrumentation including Marcia's tasteful gospel-ish piano and Mike Schermer contributing subtle acoustic guitar. The mid-tempo New Orleans-style "I'm Glad I Did What I Did" features a group known as the Hot Horns. Yeah, that pretty much describes these five cats. "Too Much For Me" is a typical Marcia Ball party stomper. I can visualize her leg kicking back and forth under the piano at breakneck pace while she pounds away on the ivories. Schermer kills it partway through with his rockin' guitar solo. Closing the album is Ms. Ball's ode to Louisiana music, "Take A Little Louisiana," given a zydeco sound via Robbie Romero's accordion and sax accompaniment from Berlin and tenor man Eric Bernhardt. What a hot number to wrap up this great, great album. I was hooked on Marcia Ball's music the first time I heard her Soulful Dress album, and my opinion of her music hasn't waned since then. I can't imagine that there are many Blues Bytes readers who aren't already tuned in to her music, but if you are among the few then starting building your Marcia Ball collection now. Shine Bright is a worthy addition to her vast library of great party blues.